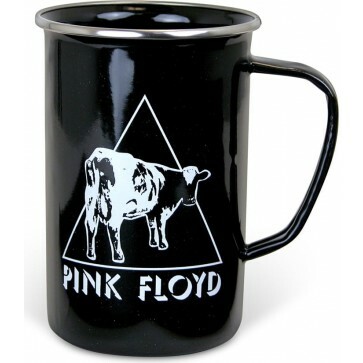 Pink Floyd 20 oz Enamel Mug. Featuring the Atom Heart Mother symbol of a Cow Inside the Triangle. Hand wash only, not microwave safe. Shine on you Crazy Diamond with the Pink Floyd 20 oz Enamel Mug. Featuring the Atom Heart Mother symbol of a Cow Inside the Triangle. Hand wash only, not microwave safe.